Every time I dig through my stash of MacGyver-Reboot-related folders, I stumble over material about the Unaired Pilot. So, since you’re not getting one of my usual Updates today, why shouldn’t I write a blog post about the Pilot Episode that – according to CBS, at least – shall not be spoken of? I have written about the Unaired Pilot every now and then, but it was usually a few bits and pieces here or there. I’ll try to put all the necessary information together for interested readers – especially since many of you accidentally landed on my blog after looking for information about it by using search machines. The idea of rebooting MacGyver has been around for a while – not surprising, since MacGyver is a well-known name all around the world. The Original Show has sold very well overseas and is still aired on TV in many countries. 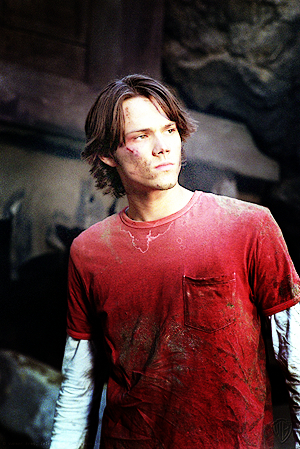 There is actually a Pilot Episode for a spinoff series called Young MacGyver (filmed in 2003, starring Supernatural’s Jared Padalecki as MacGyver’s nephew Clay), but the show never went into production. 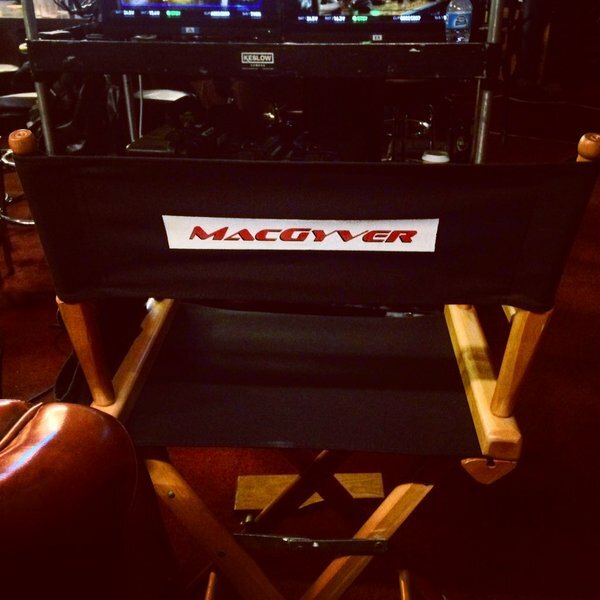 You can head over to MacGyver Online for more information (including news items, photos and a cast list) about Young MacGyver. In October 2015, the Hollywood Reporter announced that MacGyver would be brought back as a TV Show for CBS. R. Scott Gemmill (NCIS: Los Angeles) was set to write the script with James Wan (who had been attached for a MacGyver movie in 2012) directing the pilot. In February 2016, Deadline reported that CBS had ordered a pilot. Apparently not happy with the script they already had, CBS announced that the Pilot Episode would be written by Paul Downs Colaizzo. Only a few days later, Lionsgate announced that they had made a development deal with CBS for a MacGyver movie. The character descriptions – released (or rather leaked) by SpoilerTV – sparked heated discussions among Original fans since they confirmed the rumours that the Reboot would be indeed a Reboot and not a Remake, and also some sort of a Prequel and not a Sequel. 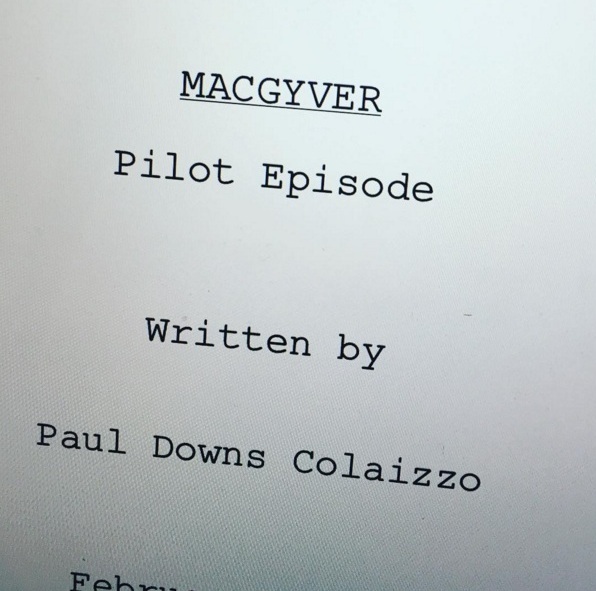 Doing a sequel wouldn’t have been that difficult, especially since the Reboot was meant to be set in present time: In the Season Finale of the Original Show, MacGyver’s son Sam (Sean Angus Malloy or S.A.M.) of about 20 years is revealed. Because the series ended in 1992, MacGyver’s son would would have been about 45 years in 2016. Why not make S.A.M. having a son of his own – or maybe even a daughter? This would have quenched the public thirst for a female MacGyver and also would have opened the doors for several cast members of the original show coming back for cameos as their original character. Also, MacGyver’s background story didn’t quite fit with the Original Show. Many commenters mentioned the story being a bit too similar to Arrow or Homeland and the storyline including the characters not being very original or exciting. Further details were announced in March by the Hollywood Reporter: George Eads (CSI) would co-star in the show as a character named Lincoln; with David Von Ancken (Code Black) directing the pilot and James Wan (Saw) as Executive Producer. The Pilot was set to start filming by the end of March in Portland. Finally, Deadline reported Lucas Till being cast as the new MacGyver with Brett Mahoney co-writing the script and Joshua Boone playing MacGyver’s best friend Gunner. A week later, Deadline revealed Addison Timlin (Californication) and Michelle Krusiec (Hawaii Five-0, General Hospital) as additional cast; the former playing a computer nerd with the latter portraying a secret agent. In April 2016, a few BtS pictures, tweets and short videos from the set finally emerged on social media – only to be deleted soon after fans had shared and discussed the “treasure” online. As it’s the usual procedure during Pilot Season, CBS tried very hard to keep the production under wraps. 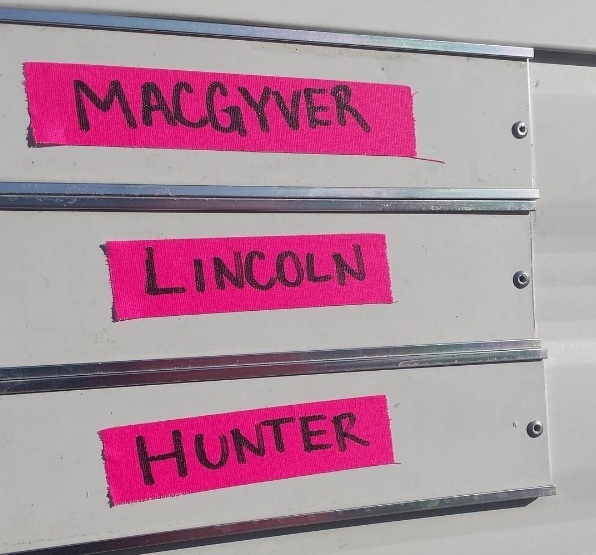 While we soon realized that the Pilot was being filmed in LA and not in Portland, there was still not a single BtS picture of Lucas Till (of course, everyone wondered what he would look like; especially what hairstyle rebooted MacGyver would be wearing). Of course, trying to keep a production under wraps doesn’t stop the curiosity – and inquiring people combing through social media for more. A first glimpse of the new logo font (provided by the director’s assistant Meg London-Boche) and a picture of the pilot script title page kept the discussions going on for days. (I remember most fans of the Original Show liking the font.) A few set pics (e.g. shot in the abandoned Hawthorne Plaza Shopping Mall) promised some interesting action sequences. The Pilot Script review by Season Zero didn’t read very promising, but it’s difficult to judge a new TV show by a single script review of an episode that hasn’t been finished yet. On the 5th of May, Meg London-Boche tweeted about the pilot being finished. Little did we know back then that the Pilot would be scrapped and reshot, earning the title of being an Unaired Reboot Pilot that got rebooted. After that, the Waiting Game started – because as Young MacGyver had taught us: in Pilot Season, a filmed Pilot Episode doesn’t guarantee that the show will be picked up. On the 13th of May, an Instagram post by Peter Lenkov confused us quite a bit. Only a few hours later, Variety confirmed that the Reboot had indeed been picked up and ordered to Series by CBS – with Lenkov being added as an Executive Producer. Surprisingly, the Hollywood Reporter hinted that the script might be tossed out and stated that the secondary cast members were “unlikely to return”. Deadline stated that Lenkov would write a new script with the general premise of the series remaining the same; confirming that the supporting cast was not coming back. While quite a bit surprising for us people not involved in the TV Show Industry, this isn’t so uncommon during Pilot Season. Sometimes, Pilot Episodes are redone with some cast members being “exchanged” (this happened e.g. with Buffy the Vampire Slayer as well with Charmed), but this seemed quite a surprising move and made us ask a lot of questions: Why ordering a pilot without a script in the first place? Why pick up a show if you don’t like the pilot? 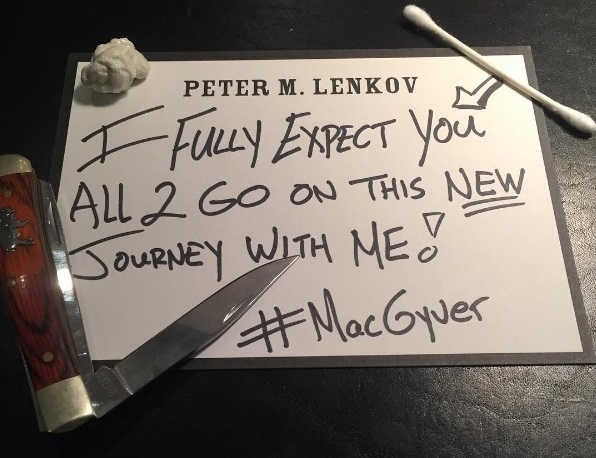 Do they care for MacGyver at all or only for the promise of making money with a well-known brand with the potential of turning it into a franchise? Isn’t Peter Lenkov already too 0busy with Hawaii Five-0? BtS picture of the Unaired MacGyver Pilot (via Ralph Cartel). Who’s Hunter? And will we ever know? Understandably, former cast members were not happy because some of them actually hadn’t known about this development until the press release. On May 16, we got the first Official Still of Lucas Till and George Eads in character – despite the Pilot Episode being scrapped and just days before the CBS Upfronts. This was going to be interesting.